How long should your flag last? Truly, there is no exact answer. It would be great if a flag came an expiration date. Should it last a month, a quarter, a year, a lifetime? Flag type, Weather, Wind, Sun, Pollution and Carelessness. Who can predict the weather? The weather on the east coast is not the same as the weather in the mountains of Colorado or the weather in Downtown Denver. No two flags receive identical wear even flying on the same pole at different times of the year. 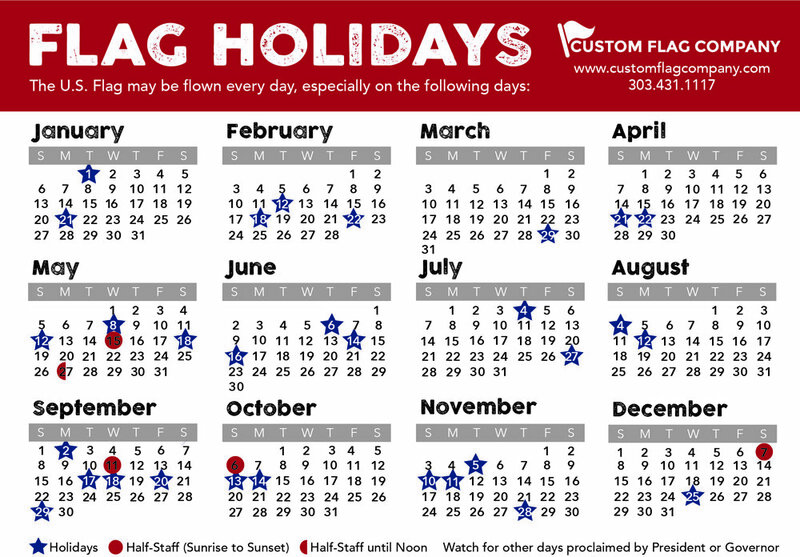 The U.S. Government generally expects a nylon or cotton flag to last 90 days based on being flown daily from sunrise to sunset - but not during periods of inclement weather. Tests have shown that, in some cases, a flag flown 24 hours a day will last only one-fourth as long as one flown only during the daylight hours. Regardless of how well it is constructed, a flag is, after all, only made of cloth and will sooner or later succumb to the elements. However, it has been well documented that reasonably good care can contribute greatly to longer life. What do you mean ...care for your flag? Give your flag the attention it deserves. Take down your flag in inclement weather. Watch the corner on the fly end of your flag. This is normally the first area to show signs of wear and tear. Occasionally washing your flag in warm mild detergent water will prevent dirt and pollutants from attacking your flag. Trim off the frayed edges and re-hem the flag. Cleaning and repairing your flag will significantly extend the life of your flag and your flag investment. We offer this service-drop it off, mail it to us or we can come by take your flag down and clean and mend it and return it a week later. Consider having two flags and rotate them on a regular basis. Your flagpole will never be without a flag. Keep one flag flying while one flag is being clean and repaired. Your flag works hard. It flies… It drapes…it whips… it quivers…it bakes…it flutters…it freezes…it strains…it ripples…it twists….it unfurls…it hangs. No wonder it needs to be replaced 2 or 3 times a year. Posted on December 2, 2014 by Kim Griebling.